Social media changes the zeitgeist in ways we couldn't have imagined. As we saw with the recent presidential election, opinions and attacks now travel at the speed of light. And so it should be no surprise that the ongoing Middle East conflict in Gaza between the Palestinians and Israelis has escalated into a Cyber war. While the conflict may seem like history repeating itself, social media is actually changing the way the public sees the violence. As several news agencies have reported,Israel is now using social networking sites like Twitter, Facebook, Flickr and YouTube to its advantage in its war with Hamas in Gaza. In the past Israel has had to rely upon mainstream news agencies to report on the back-and-forth actions in Gaza, but now the Israeli military and government can take its message straight to the people using its social networks. While Israel launched its surprise attack Wednesday on Gaza, it declared it to the world on Twitter, arguing its case for the new campaign against Hamas in less than 140 characters. 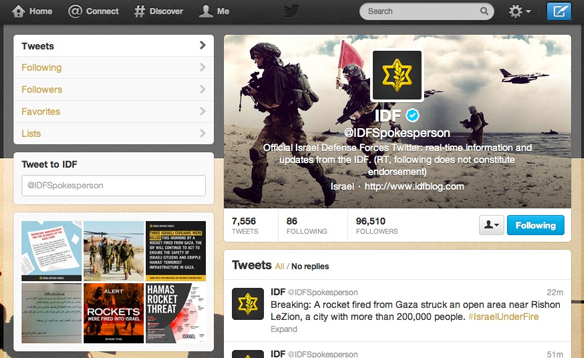 Minute by minute, the Israel Defense Forces fed followers information and arguments on the strike. At their computers, Internet users could click through aerial photos, check updates on the offensive and watch a YouTube video of the strike killing the Hamas military chief. At one point, the Israeli military traded Twitter barbs with Hamas. “We recommend that no Hamas operatives, whether low level or senior leaders, show their faces above ground in the days ahead,” the @IDFSpokesperson account tweeted Wednesday. However, YouTube apparently changed its corporate mind and allowed the video to be shown. A company spokesperson explained, “With the massive volume of videos on our site, sometimes we make the wrong call. When it’s brought to our attention that a video has been removed mistakenly, we act quickly to reinstate it.” Most likely enough anti-Israel YouTube users had flagged the video triggering a review process until someone at YouTube could view the video in question and make the decision. By reinstating the video, YouTube opened up a whole new front in this war. In taking the Middle East conflict to the Web, the opportunity for hacking has also been escalated. So it was no surprise early yesterday morning when a hacker group called "Anonymous" announced a mission to crash and deface websites belonging to the IDF, Israeli Prime Minister Netanyahu and other Israeli websites belonging to security and financial corporations. Using Twitter, the hacking group urged its followers to bring down more than 40 websites belonging to the Israeli government and military. In a statement, the hackers stated, "We will do everything in our power to hinder the evil forces of the IDF arrayed against you. We will use all our resources to make certain you stay connected to the Internet and remain able to transmit your experiences to the world." Already the hacker group has claimed to have taken down Israeli’s “top security and surveillance website.” They also released a "care package" with tools for staying online if the Israeli government cuts off Internet access in Gaza. Another hacker group called Telecomix posted a message online with instructions on how to use dial-up Internet to stay connect if the Web is shut down. According to Forbes.com, most of the Anonymous’ target websites were still online. 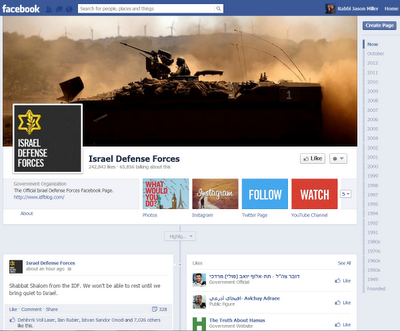 Another new front of the Middle East war in Gaza has been the public discourse on social networking sites. As soon as the conflict escalated advocates on both sides of the conflict began using Facebook to show their support. Pro-Israel supporters began simply updating their Facebook status with the Hebrew words עם ישראל חי (Am Yisra'el Chai) meaning "The nation of Israel lives." Other Facebook and Twitter users reposted news reports of the direct hit on the Gaza leader and reminded their followers that the news coverage of the conflict has not accurate covered the escalation as thousands of missiles had already been fired into Israel from Gaza. Yesterday, in a show of support many users on Facebook began posting photos of IDF soldiers from visits to the Jewish homeland. On Twitter, #Gaza and #Jerusalem have been trending off and on over the past few days and many heated back-and-forth conversations have taken place on the site. The IDF's Flickr site has also seen a huge uptick in traffic with many users reposting photos from that stream to their own Pinterest boards. Additionally, the IDF's Facebook page has noticed a sharp increase in fans approaching a quarter million. The IDF page's recent status was "Shabbat Shalom from the IDF. We won't be able to rest until we bring quiet to Israel." The long-simmering conflict between the Israelis and Palestinians will be the first test of the social media zeitgeist. Newspapers and television news outlets are still relevant, but this will go down as the first war that was also played out in real time on the Web. In the social media era, anyone and everyone can become a reporter. And the millions of vehement opinions will likely only raise the heat of this escalating conflict. Israel’s Operation Amud Anan differs from past Israeli operations in many ways. A key example of this has been that we’ve seen social media become an additional platform on which the battle gets played out. For the first time in history, American Jews, in fact all Jews, can demonstrate measurable and immediate support of Israel and to participate in the battle being waged, by lending a hand as part of the social media campaign. This handout, a collaborative product of a few colleagues, seeks to maximize the potential of American Jews to mobilize on social media in support of Operation Amud Anan. Understand that this effort to combat misinformation and bias does not replace any and all efforts towards peace, dialogue and a peaceful resolution of the situation. It merely recognizes that the barrage of missiles on Israeli civilians needs to come to an end and it supports Israel’s right to protect those civilians. The lists on this page are NOT an endorsement, nor are they to be considered “expert” resources. In fact, it would be amazing to grow the list as this handout is shared around the country. ● The more you can retweet those you are following the more others will see. ● Be sure to identify your tweet with a hashtag associated with the situation. ● Tweet media outlets, your government representatives and others about the situation and especially share out with them information that might bring some “balance” to news. ● Think about the hours of the day when people are most likely pausing to look at Facebook and be sure to post something during those times to get “bang” for your feed. ● Use Pinterest to “pin” all the photos; videos; blogs; about the news. Follow and connect with local, national, and international organizations like your Jewish Federation and other Israel advocacy groups. You can share personal stories from friends and colleagues (with their permission) which can help others understand how the situation directly affects those involved. Pass along information about how to help and where to find reliable sources of information. We welcome your comments about this work, but more importantly we welcome you taking this handout, transforming it in whatever ways you feel will make it meaningful to your community. We need your voice and invite you to share it in a free and open way to as many in your circles you feel you can.